The Book: Anyone familiar with Seattle’s restaurant scene will have heard of Renee Erickson’s four establishments – Boat Street Cafe, The Walrus and The Carpenter (an oyster bar and seafood spot), The Whale Wins (where the menu is centered around a massive wood-fired oven), and Barnacle (an aperitivo bar for drinks and tapas). 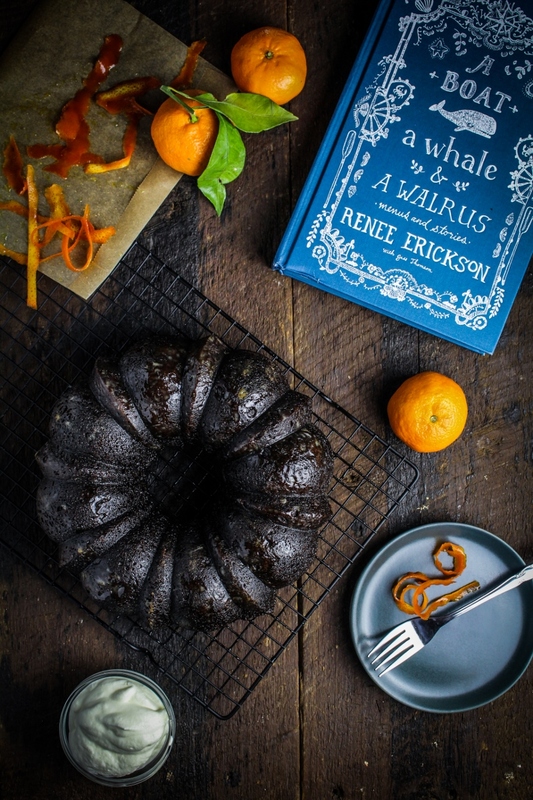 Riding the wave of her success in the restaurant world, Renee has just released a cookbook, A Boat, A Whale, & A Walrus, that documents the evolution of her career and cooking style. The book, which is organized into seasonal menus such as a 4th of July crab feast and an autumnal Normandy dinner, is a lovely ode to simple meals designed to share with friends and family. Something about the book feels unhurried to me, perhaps because the structure is fluid and Renee meanders from a lengthy description of smoked salmon to a series of short-and-sweet “winter ingredients” recipes to a profile of her butcher to a short list of favorite holiday wines, all within a few pages of one another. Adding to the unhurried effect is the soft feel of the design, from the thick off-white paper to the muted, soft-focus images. The food is not fancy or overdone, but simple and refined – recipes to make at home and share, like a mushroom and leek strata for a winter brunch or a pot of manila clams, served with wine, creme fraiche, and herbs, as the centerpiece to a spring dinner. Some of the best recipes are hidden away on the seasonal ingredients pages, which feature short paragraph-style recipes for a handful of ingredients: in spring, favas (grilled whole favas over ricotta with honey), nettles (slow-braised nettle soup), and sorrel (salmon with sorrel cream sauce); in fall, brussels sprouts (brussels sprout carbonara with cayenne), eggplant (pickled baby eggplant), and radicchio (radicchio and comte tart). Of course, the fishing and foraging vibe of the Pacific Northwest comes through strongly, and mussels, salmon, clams, crab, mushrooms, and hearty greens all receive their due. The Food: I’ve bounced all over the place trying to decide what recipe I wanted to make for you from this book. First it was the Celery Root and Celery Leaf Salad with Pomegranate and Meyer Lemon Vinaigrette, but then after I purchased the ingredients Trevor told me he’s allergic to raw celery root, so that ship sailed. I toyed with the idea of making the Martinis with Anchovy-Stuffed Olives and Preserved Lemon for New Year’s Eve, but I’m really just not a gin person (although that recipe Trevor would absolutely love, so maybe I’ll make him one some night soon). Same goes for the Pickled Mussel Toasts with Garlic Aioli – sounds delicious if you eat mussels, which I don’t. I flipped through the pages of the book countless times, hemming and hawing. 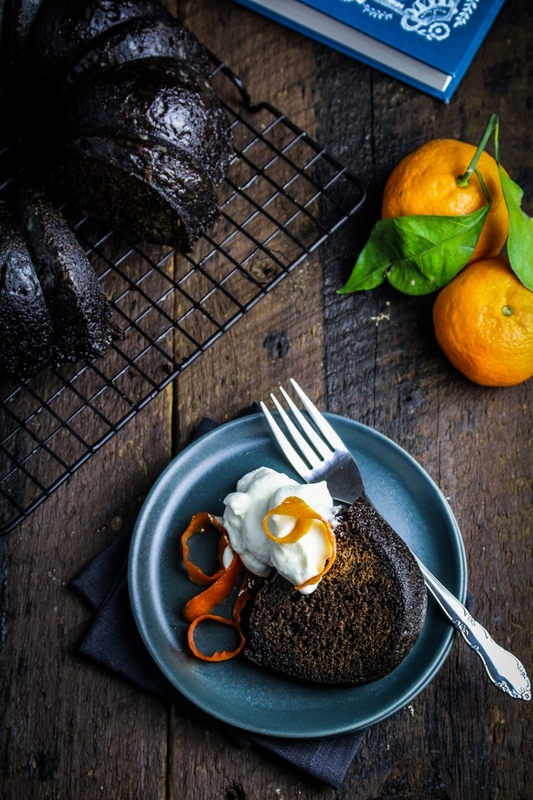 In the end, the recipe that called to me the most was this Molasses Spice Cake with Candied Orange Peel. Yes, it’s 100% a perfect Christmas recipe. And yes, Christmas Day has already passed. But we have a lot more cold winter mornings ahead of us and this cake is just as appropriate for January or February as it is for December. Besides, Christmas technically lasts until January 6th, so we’re having spice cake. 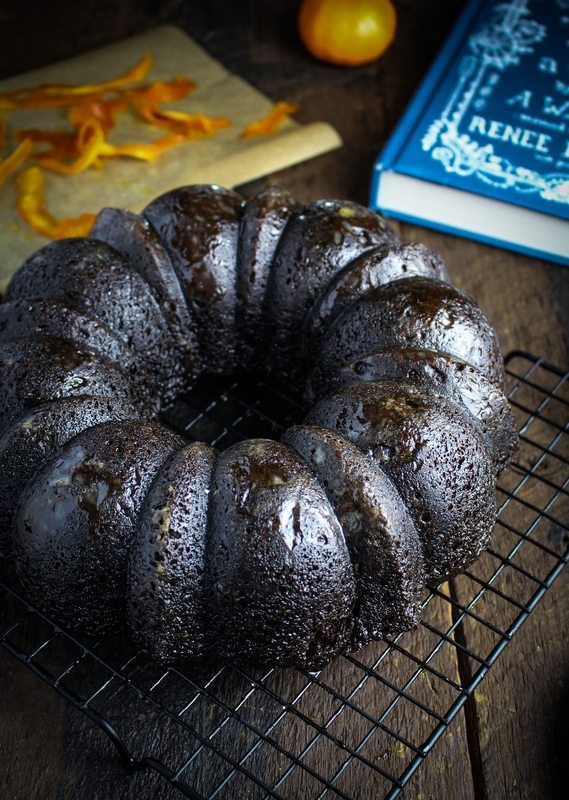 This cake is a rustic, bundt-pan affair. 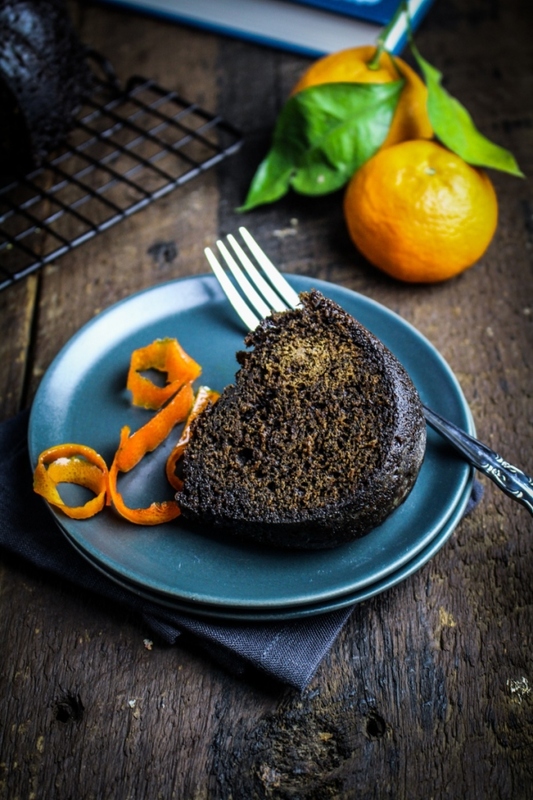 It’s dark and spicy, flavored with espresso, molasses, mustard, and black pepper, then glazed with orange juice and topped with candied orange peel. Trevor described it as elemental and I think that word is a good fit. It must be served with a healthy dollop of whipped cream, for the contrast of the cream’s sweet lightness to the cake’s spice and density. The only tricky parts about making it are adding a full cup of coffee to a butter-based butter without it separating (just go slowly) and perhaps candying the orange peel, although really that’s rather straightforward too. Even if you’ve put away your flour and sugar for this year, bookmark this one for the next time you need a cake that’s rich and wintry. Disclaimer: I received a review copy of A Boat, A Whale, & A Walrus from Sasquatch Books, but I was not otherwise compensated and all thought and opinions are my own. Recipe from A Boat, A Whale, & A Walrus. Serves 10-12. Preheat the oven to 325°F. Thoroughly butter and flour a bundt pan, tapping out any extra flour. I find it easiest to use a tablespoon of melted butter and a pastry brush to brush the butter into all the nooks of the pan. In a medium bowl, whisk together the flour, baking soda, salt, ginger, cinnnamon, mustard and pepper until evenly combined. Set aside. In a large bowl or a stand mixer, beat the softened butter until pale and fluffy. Add 3/4 cup of the sugar and beat vigorously until sugar is fully incorporated, at least 1 minute. Beat in the eggs one at a time, mixing between additions. Beat in the molasses until it is fully incorporated. Slowly drizzle in the espresso and milk mixture, mixing the batter the whole time. If the batter begins to separate, stop the addition of the coffee and add a little bit of the flour mixture to the batter to help work the butter back into the batter, then continue mixing in the coffee. Add the dry ingredients to the flour and stir until just incorporated. Batter should be fairly smooth. Spoon the batter into the prepared bundt pan and bake until a toothpick inserted in the center comes out clean, about 45-55 minutes. Let the cake cool in the pan for 10 minutes, then invert the cake onto a cooling rack. To make the candied oranges, use a vegetable peeler to cut the peel from the oranges, being careful to remove only the orange peel and not the white pith underneath. Cut the peel into strips 1/4 inch wide, then place the peel in a small saucepan and cover with water. Boil the peel for 5 minutes, then drain. Squeeze the juice from the oranges into a cup, adding water to equal 1 cup of liquid. Add the orange juice and the remaining 1 cup of sugar to the saucepan with the orange peel. Bring to a simmer over low heat, and simmer until peel is shiny and almost translucent, about 10 minutes. Don’t turn the heat up too high or the liquid may boil over. Remove the candied peel with a spoon and let dry on a piece of parchment paper. 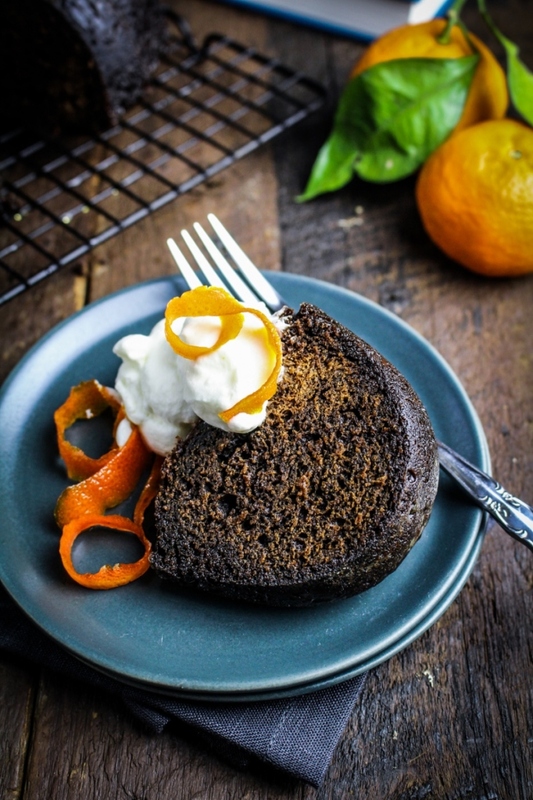 Use the orange syrup in which you candied the peel to glaze the cake: brush the glaze on the cake while the cake is still warm, letting the cake dry for 2-3 minutes after each coat of glaze. Do this until all the glaze has been used and the cake is shiny. Serve the cake with the candied orange peel and freshly whipped cream. Too beautiful! I just saw this on your instagram and my mouth was watering! I do love baking with molasses.. it always adds the most delicious burnt sugar taste. This bundt cake is definitely a recipe for me – I have to try it! I love Lewis Carroll’s poem “The Walrus and the Carpenter”, so I’ll have to keep my eyes open for this book. Your spice cake looks beautiful and delicious! I have plenty of molasses (I take a Tbsp. a day…). Katie, I hope you had a merry Christmas and have a happy and healthy New Year!